so I set up a POC server. I was able to deploy it as a relay for OS bare metal deployment. When I go to the “OS Deployment Server Information” in the analyses section it shows up. and the Master Server its VM1. "To start working with OS Deployment, run the configuration Fixlets and tasks listed in the Setup Node." Actions box to deploy the plug-in. Only your root server needs the Upload Maintenance Service installed & configured. This is an API task that, among other things, takes care of removing OS images from the server when you delete them from the OSD Image Library dashboard. How far have you gotten on the new OSD server VM2? You need to have the bigfix Relay installed on it, then use the Bare Metal Server dashboard to install the Bare Metal Server service on it. root servers need Upload Maintenance Service only for versions lower than 9.2.14 if 9.2 or lower than 9.5.9 if 9.5. For these versions and later the fixlet that installs Upload Maintenance Service will not be relevant. I also installed the “Update Server Whitelist for OS Deployment” but only the root server shows as relevant. I think it’s because it’s lower than 9.5.9. Is it correct? o yes, it’s 9.5.6.63. I dont know when we would be updating it. Sounds correct so far. For the next part (MDT Bundle Creator & OS Resources), you’ll need to use the Bundle and Media Manager Dashboard rather than looking for fixlets directly. I’m trying to deploy the MDT bundle from within the Dashboard, but its failing. so I did a reboot the first time. Can my Baremetal Server (VM2) be the same as the MDT Bundle Creator. or is this Bad practice? I mean, isn’t the MDT blunder supposed to be installed only so it can extract the tools. According to the action script, it is performing a check based on WADK being preinstalled on the target. 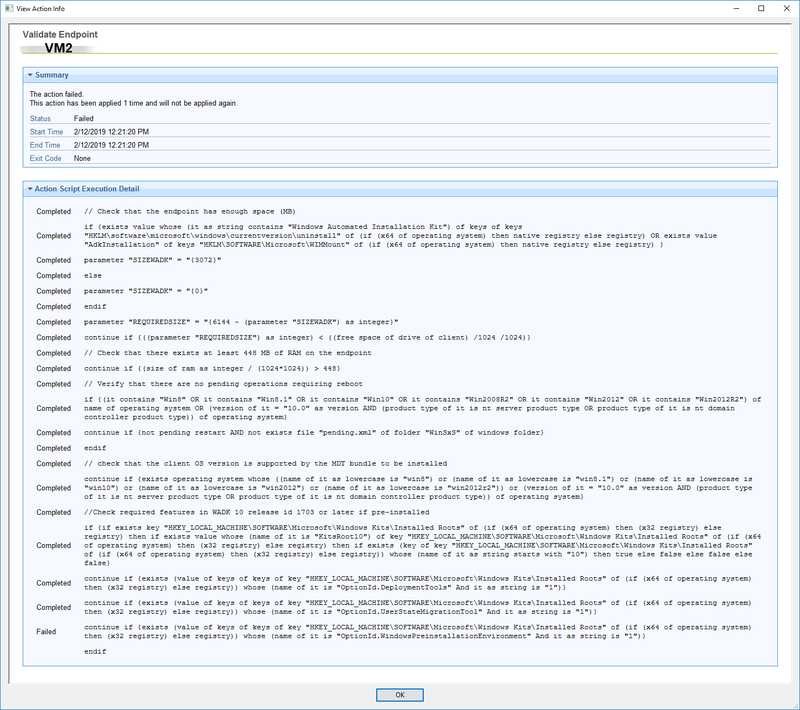 If WADK is not already installed, the baseline action will install it for you; but if it is already preinstalled, it requires several of the WADK features to be present. In your case, it looks like the target for this action already has WADK installed, but is missing the Windows PE feature. If you aren’t already using WADK on this host for something else, I think the easiest thing for you would be to uninstall WADK, reboot the machine, and send this action from the Dashboard again. That will allow the server to install the latest version of WADK configured for OS Deployment. I don’t think that’s a bad practice at all, but it really depends upon your environment. Ideally, the Bundle Creator machine would be a host somewhere near your management console. After you generate a Bundle, you need to use the Console Dashboard to upload it to the server. Because of the way the console accesses the bundle to generate SHA256 hash values for the bundle, it is really inefficient to access the bundle across a network drive - you should copy it locally to your console machine first, and then upload it through the Bundle & Media Manager dashboard using your local path. 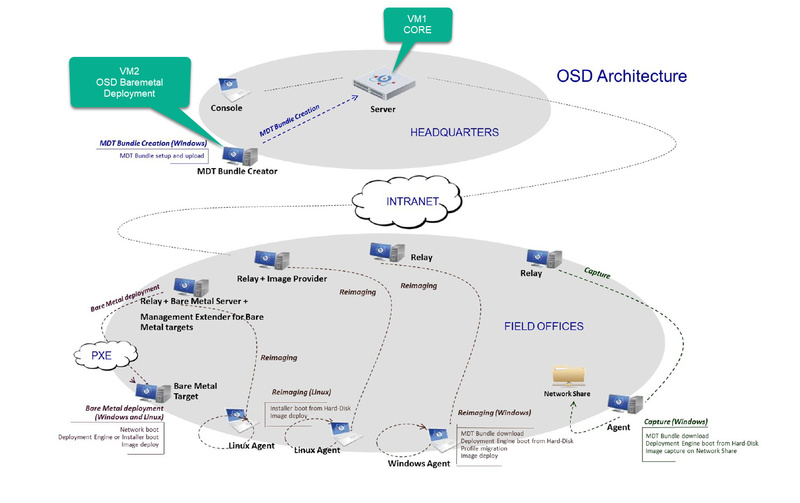 Many deployments have multiple OSD Bare Metal Servers, and those servers should be close to your client targets rather than close to a central server or console workstation. With multiple OSD servers, you still only need one host to generate the MDT bundles that would be used by all of them, hence those are shown separately. you should copy it locally to your console machine first, and then upload it through the Bundle & Media Manager dashboard using your local path. I’m not why I was thinking that I would be able to configure a VM with plain windows fully patch. then PXE boot the VM into the BigFix options and be able to select capture image. I’d strongly recommend you use a virtual machine for your capture - it’s nice to have a VM snapshot handy before you try to capture, because if there’s a problem in Sysprep you have to start over. You’d need to install the OS and Bigfix client. Once you have it patched, configured, (and snapshotted), I’m pretty sure there’s a Capture dashboard (away from my console and can’t look now). 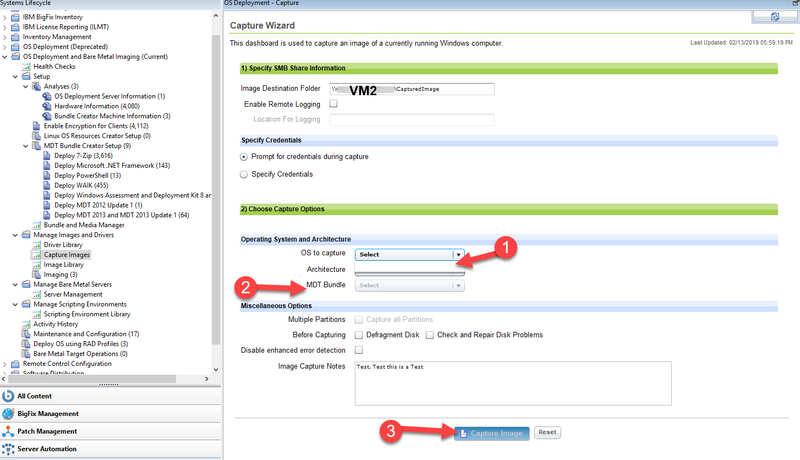 The Wizard asks where to save the captured WIM file (a network share and credentials). When you complete the Wizard, it sends an action to the client. It copies a bootable WinPE image to the client, runs Sysprep on it, reboots into the WinPE, executes the capture, and copies the captured WIM to the share you specified. Once that’s done, copy the WIM image and associated info files to your console machine, and upload it to Bigfix using the Image Library dashboard. Once uploaded, create a Bare Metal profile for it and ‘Send Profile’ to your bare metal server. Then you can boot additional clients into PXE to download the image to them. You’d need to install the OS and Bigfix client. Once you have it patched, configured, (and snapshotted), I’m pretty sure there’s a Capture dashboard (away from my console and can’t look now). I’m assuming here that I have to Sysprep the System. or does BigFix do the Sysprep for you? I also looked in the console and I didnt find anywhere to snapshot the VM. Unless Im misunderstanding and its a snapshot of the Hyper-V VM that I have created the Windows 10 patched and all. You don’t need to run sysprep, the action that is generated from the Capture dashboars will run sysprep for you. Yes, when I say snapshot I mean a snapshot taken from Hyper-V, VMWare, VirtualBox, or whatever virtualization tool you are using. Bigfix does not do that part for you. and last Dumb question. do you put the system in Audit mode? I think I know what I’m missing. I’m too excited and jumping steps. 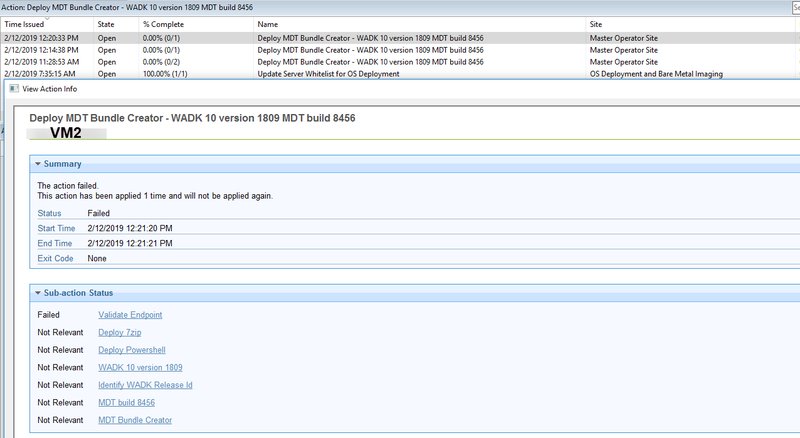 what is "Create a new MDT bundle only"
I’m still confuse >.< what does this do. is it like the needed files to capture an image? 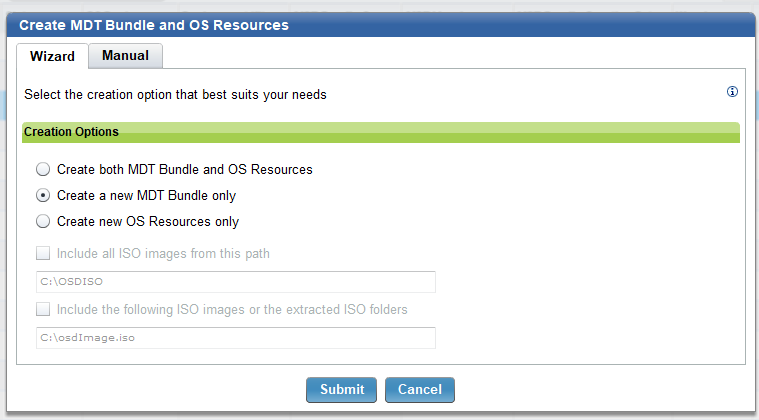 what is " Create new OS resources only"
The MDT Bundle contains portions of MDT, unattend.xml, sysprep, USMT, and things like that to manage reimaging. OS Resources are things like Windows PE. You can create both together, or separately. In rare cases you might customize the MDT workflows, and then not want your changes overwritten when you step up to a higher WinPE. You don’t need OS resources for each edition. In fact, you can only have one of each WinPE present - a new PE10 will overwrite existing PE10, a new PE4 will overwrite existing PE4.